Ahoy Pirates! I wanted to make this short little blog about a Poll I really wanted you all to vote for. MMOBomb is having a F2P showdown against Aion. Do you love Pirate101? Go ahead and vote for what game you think is best by clicking HERE or by clicking the image attached to this blog post! I have that feeling Pirate101 will win. Let's show Kingsisle how much we love Pirate101 by voting for them. Show MMOBomb which game you think is the best by voting. 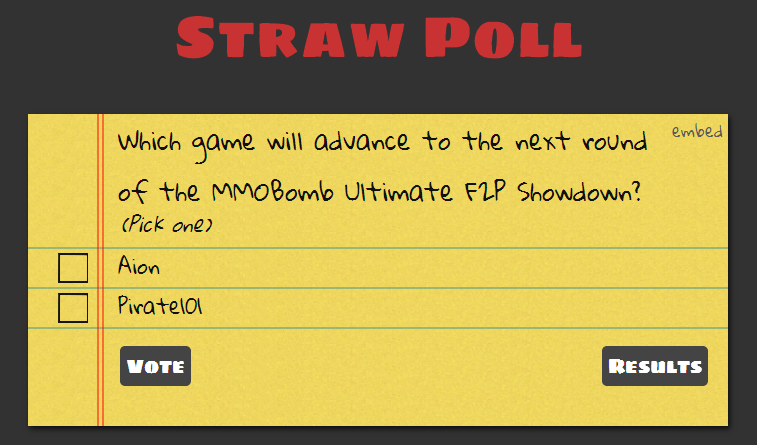 :) More information about the showdown can be found by clicking on this link: http://www.mmobomb.com/ultimate-f2p-showdown We have until March 2nd to vote so make sure you cast your vote before it ends.